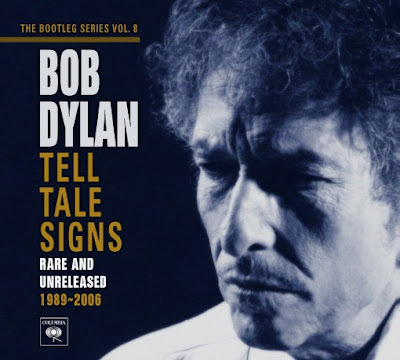 Robert Zimmerman aka Bob Dylan...an American poet has released TELL TALE SIGNS - THE BOOTLEG SERIES VOL. 8 Rare & Unreleased 1989 - 2006. Think about that, number 8 in the series. Dylan was the first rock artist whose music was bootlegged. He transformed himself from a folk artist to a rock star, angering some fans, but garnishing so many more. On Friday I had to drive to visit my friend Charlene whose dad was dying (he did pass on Monday, may he Rest In Peace) and before I left I loaded the 2 CDs into my car's CD player. I will admit that I have never been a huge Dylan fan. I have always enjoyed his music but I have never gone out of my way to own a lot of his music. I was fortunate to see him perform at the Philadelphia Spectrum in 1974 and it was an incredible show. During my drive the music began and I have to tell you I was entranced the entire time. The songs on these CDs are mostly unreleased or alternate versions from albums ranging from TIME OUT OF MIND, OH MERCY, and MODERN TIMES, a few soundtrack recordings as well as some live performances. Many of the songs are stripped down versions of music you have heard and loved. Twenty seven short stories told by the master of putting words to music. One song appears twice on this collection, the very special "Mississippi". It opens CD 1. Nothing like the version that appeared on the album LOVE AND THEFT, it is stripped down and soulful. Dylan is backed only by Daniel Lanois on electric guitar. While Dylan is still the "stranger that nobody see", there seems to be more hope in his voice. I really love this version of this song. It also appears as the opening song on CD 2 with the entire band. It does not have the same hopefulness as the other version presented here, but is still wonderful to listen to. I also truly enjoyed the song "Dignity" in a bare bones piano demo version. Some lyrics are different than the version released on OH MERCY, something Dylan is well known to do during the recording of his albums. I think the most interesting and, for me, incredible song in this set is "32-20 BLUES", the Robert Johnson classic. Dylan wrote in his memoir "Chronicles - Volume One" that Johnson had a tremendous impact as Dylan began his career as a songwriter. If you don't think Dylan can do the blues, this track will change your mind. All I can say is, if you LOVE Dylan, you need this collection. If you are a casual fan like me, this could be the collection that turns you into a BIG fan. Now enjoy the songs "Mississippi" and "Ring Them Bells"
And you just keep 'em coming don't ya Vinny? Good stuff! Bob has calmed my soul on many a morning while living in some various party houses of the past. He would always be my morning choice of music to wake a groggy house of friends. I am pretty big fan of Dylan, but then again, aren't most Communists? Cheers Vin!! MATT-MAN: That is what I have heard my friend. Great review. I am always on the lookout for some new music to enjoy. I do get tired of the same old modern country sound of late. Thanks for sharing. I'm on the road and will have to listen later. Like you, I was never a fan of Dylan, or at least his voice. I always thought he was a great songwritter/arranger, but his voice left a lot to be desired. It's amazing how becoming a music icon can change one's perspective. Always good to hear a different take on old favorites. I'll have to come back & listen later, but OMG IT'S DYLAN - YAY!!! this was an enjoyable post...thanks. Picked up another icon CD today. Carlos Santana has a double CD set called "Multi-Dimensional Warrior". If just gotten through the first disk. You need to hear this and review it. There is some very tasty stuff here. Excellent review, Vinny. I have to say Most Of The Time is one of my favorite Dylan songs. A great album. I'm one of those fans that can listen to anything Dylan does, but this is a special album. I loved it. I'm in the minority, but I've never been a fan.